An iterative design and development model for learning projects. Successive Approximation Model (SAM) is an Agile inspired model for instructional design created by Allen Interactions. The iterative development approach of SAM is in contrast to the linear ADDIE model that is popular with instructional designers. SAM1: A basic model for small or one-person teams with low levels of technology. SAM2: A comprehensive version of the model that is suited to larger, complex learning projects. Why use the SAM model for learning projects? SAM focuses on learner experiences, engagement, and motivation rather than the organisation of content, presentation of information or end of course quizzes. The quick feedback loops ensure that the resulting learning activities are adequately tested and provide a suitable learner experience. How is the SAM model used? SAM1 starts with a loop that analyses, designs and develops a rapid prototype. This prototype is then tested for feedback and the loop is repeated two more times. After the third loop, a small tested learning product is ready for release. SAM2 starts with a preparation phase of information gathering and a kick-off meeting of project staff and stakeholders in the form of a Savvy Start. Then follows an Iterative Design Phase that contains a loop of Design, Prototype and Review that is repeated three times. The design phase produces a Design Proof which is a plan for the development phase. 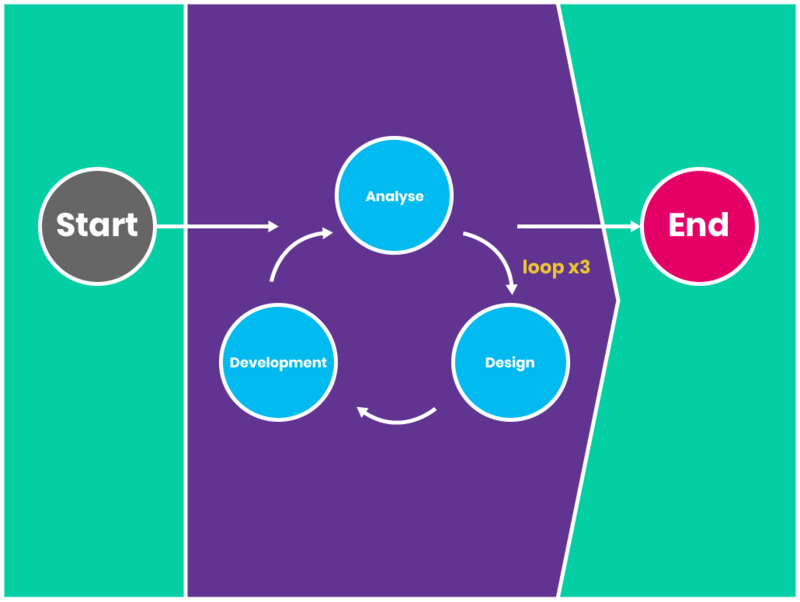 The Iterative Development Phase begins with a loop of Develop, Implement and Evaluate that is also repeated three times. In line with software development, the output of each of the development loops contain Alpha, Beta and Gold versions of the software. Once Gold is reached, the course is ready for rollout. The agile approach that SAM takes to the management of a learning project is well suited to digital learning products that have a high technology dependency. Although many of the elements of ADDIE are present in SAM, the iterative approach reduces risk and ensures relevant testing is carried out early and regularly to improve the learner experience. Pros: Iterative development and user focused. Early and continued Stakeholder engagement. Cons: Due to heavy influence of software development models SAM is more suited to digital learning projects.